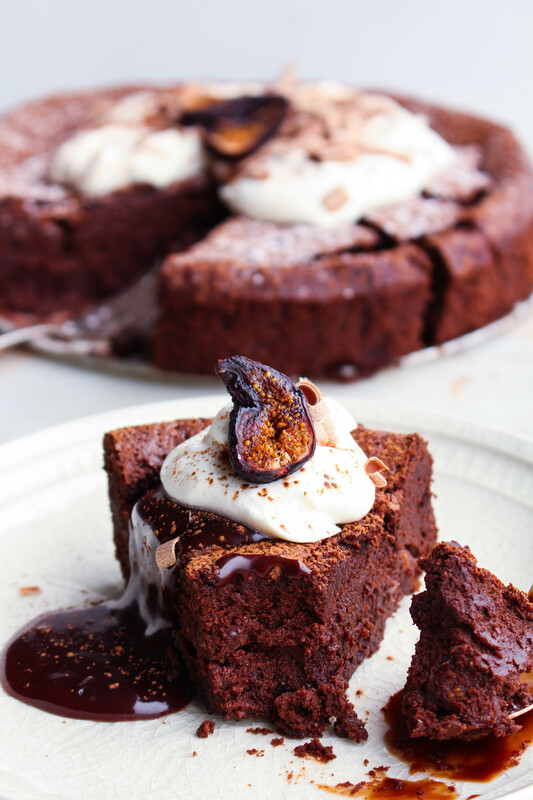 It’s no secret that I am a fool for a good chocolate cake, but this Flourless Chocolate Cake with Brandied California Figs might have just taken the number one spot on my list of favorite desserts. If you love chocolate and if you love figs - there is no doubt that you too will absolutely love this cake. It’s almost unbelievable how chocolatey and fudgy this cake is. Because there is no flour in the recipe, the cake gets its structure from fluffy egg whites - which also happen to give the cake a texture that is out of this world amazing. Honestly my feelings for this cake are so strong, that I have been seriously struggling to come up with the words to describe it, that will give it the justice that it deserves. I have to say that the more I think about it, the more I really believe that it’s a dessert that you just need to experience for yourself. However, if you are really trying to understand how delicious this cake is before you bake it; Just imagine a dessert that is like a cross between a super moist chocolate cake, a fudgy brownie, and a fluffy chocolate mousse. Now who wouldn’t want to eat that dessert? Slice the figs in half & place in a small mixing bowl. 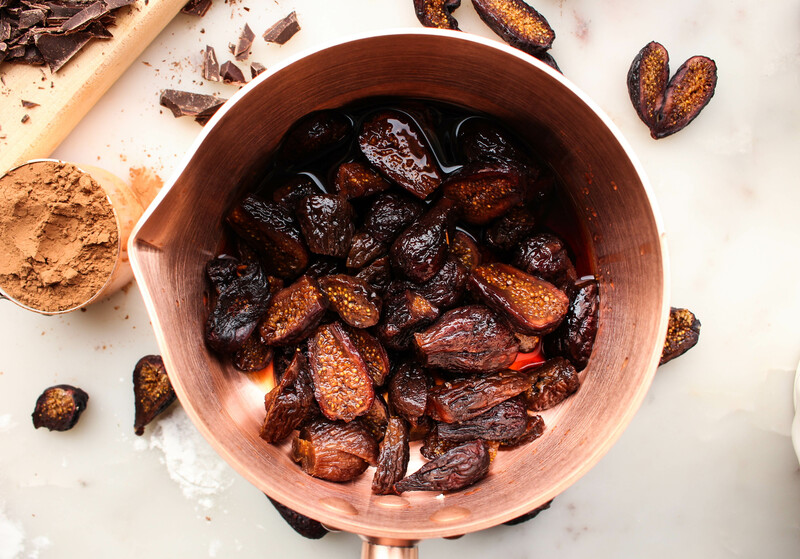 Pour brandy over the figs to submerge; Set in the fridge for 2-3 hours or overnight. Pre-heat oven to 350 degrees. Grease a 9 inch springform pan and coat with cocoa powder; set aside. *Strain figs from brandy and reserve liquid for the chocolate sauce. Chop brandied figs roughly and set aside. Separate egg whites and egg yolks into two separate bowls. In a saucepan over medium heat, melt the butter and the chocolate. Remove from heat and stir in sugars and cocoa powder. Stir in egg yolks and vanilla until combined. Slowly add in coffee. Beat egg whites on high until soft peaks form. Gently fold the egg whites into chocolate mixture in three additions. Just as the batter is starting to combine with the last addition of the egg whites, add chopped brandied figs and mix to combine. Pour batter into prepared baking pan and bake for 40-45 minutes or until the top begins to crackle and the centre is set. Remove from oven and allow to cool completely. 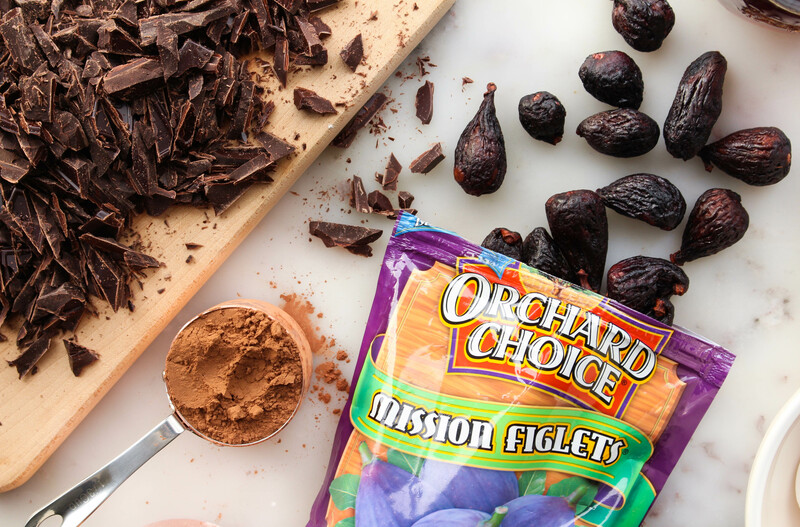 While your cake cools, make your chocolate fig sauce. In a saucepan over medium heat, melt the butter and chocolate chips. Once melted, slowly add in evaporated milk & sugars. Bring mixture to a boil & reduce heat & allow to simmer to about 5 minutes or until thickened. Remove from heat & stir in vanilla and fig brandy. Serve immediately or allow to cool. * The sauce will thicken more as it cools. 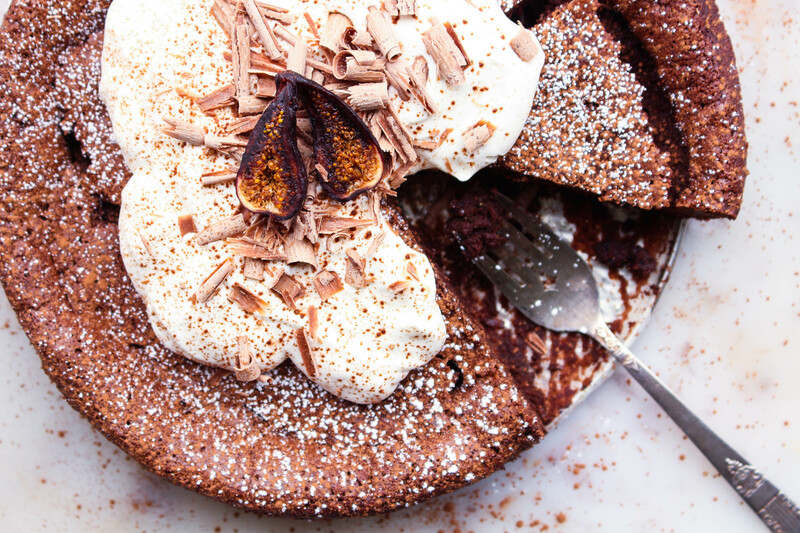 Serve with a brandied fig chocolate sauce, whipped cream & chocolate shavings. Enjoy! This post is sponsored by Valley Fig Growers.